#EDlection2018: Where do California governor candidates stand on education and children’s issues? Check out their responses ahead of Tuesday’s forum in Los Angeles. LA School Report is presenting the nonpartisan governor’s forum at Los Angeles Trade Technical College with the Chronicle of Social Change, the Children’s Defense Fund-California, and the Children’s Partnership. Delaine Eastin, 70, a Democrat, is a former California State Superintendent of Public Instruction. She taught at community colleges before running for office. She was a city council member in Union City, a state assembly member from 1986 to 1994, and state superintendent from 1995 to 2003. Eastin served on the board of SIATech California Charter Schools, which operates charter high schools around the state. She said charter schools have been “co-opted by multimillion-dollar industries.” She said she won’t accept any campaign contributions from state or national charter school organizations. 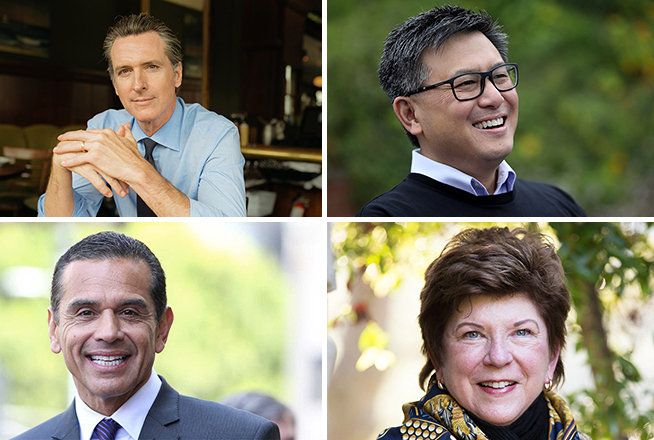 Of the top four Democrats running for governor, Eastin has raised the least amount of money. Read Delaine Eastin’s answers. Antonio Villaraigosa, 65, a Democrat, is a former Los Angeles mayor. He was a union organizer for United Teachers Los Angeles who later joined a lawsuit that challenged state teacher tenure and layoff rules. He was a state Assembly Speaker, a Los Angeles City Council member, and chaired the 2012 Democratic Party National Convention. During his two terms as Los Angeles’s mayor, he sought to take over Los Angeles Unified school district to turn around schools he said were failing the neediest students. When that was blocked, he formed the Partnership for Los Angeles Schools, a nonprofit that took over some of the city’s most struggling schools. Read Antonio Villaraigosa’s answers. John Chiang, 55, a Democrat, is the state treasurer and former controller. He is little known outside the state but is liked by labor, particularly public employees, and, as the son of Taiwanese immigrants, has appeal to the state’s large Asian communities. Chiang’s education ideas have centered on better accountability for charters, more education funding and more flexibility at the local level to raise funds, early education, and free community college. Read John Chiang’s answers. Gavin Newsom, 50, a Democrat, is California’s lieutenant governor who served two terms as mayor of San Francisco. Newsom leads the pack in fundraising and is running as the campaign’s progressive, which some find incongruous with his success as a businessman, who founded and owns a constellation of restaurants and wineries. He supports community schools, a union job-creator, and doesn’t reject charter schools. In his campaign for mayor, he touted their success and received funding from backers. This year he won the endorsement of the California Teachers Association when he answered “no” to whether charters should expand in the state. Read Gavin Newsom’s answers. The two Republicans — John Cox, 62, a San Diego-area venture capitalist, and Travis Allen, 44, an assemblyman from Orange County — have not submitted answers to the questions ahead of the forum. Allen will not attend the forum; Cox and Newsom have not confirmed they plan to attend. Register here for Tuesday evening’s free event and prepare to vote in the June 5 primary, which will reduce the field to the top two vote-getters. Don’t forget to RSVP for “Building Our Future: A Forum on Children with California’s Gubernatorial Candidates,” at 6 p.m. on May 15, by clicking here. LA School Report will livestream the forum. The interviews are published in partnership with The Chronicle of Social Change.